Maxximum Mind Muscle Booster is sugar free which makes it an ideal food supplement for those who are on Ketogenic or LCHF diet. 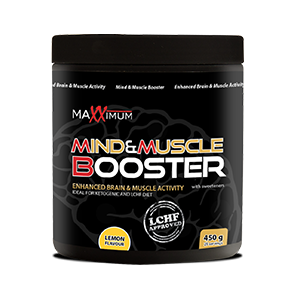 Maxximum Mind Muscle Booster has also added caffeine (150 mg/serving) in order to improve training endurance and concentration during your workout. 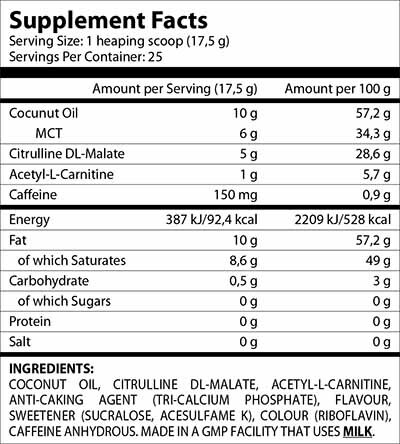 Coconut Oil, Citrulline DL-Malate, Acetyl-L-Carnitine, Caffeine, Anti-Caking Agent (Tri-Calcium Phosphate), Flavour, Sweetener (Sucralose, Acesulfame K), Colour (Riboflavin). Made in a GMP facility that uses Milk. Mix 1 heaping scoop (17,5 g) with 400 ml of water. Stir until dispersed. Consume 30 minutes before workout. As a food supplement, consume 1 serving per day.